Thanks SO much for reading dolls!!! You don't know how much your comments make my day!!! Uhh..I like you with glasses!! Ah thank you so much girl! :) I got these at target and love to wear them! aww you look adorable in reading glasses! and i like the way you belted the chambray over the pencil skirt. i usually tie the bottom of the blouse into a knot, so this is a fun alternative :) And seattle doesn't seem to be moving towards fall either- i'm ready for sweaters and it's just not having it!! Oh I love the idea of tying the bottom of the blouse into a knot too---so cute!! I am so ready for fall weather girl! Thanks for reading & commenting girl! Dont mind if I do comment on all the pictures& posts ive missed out on this past week. 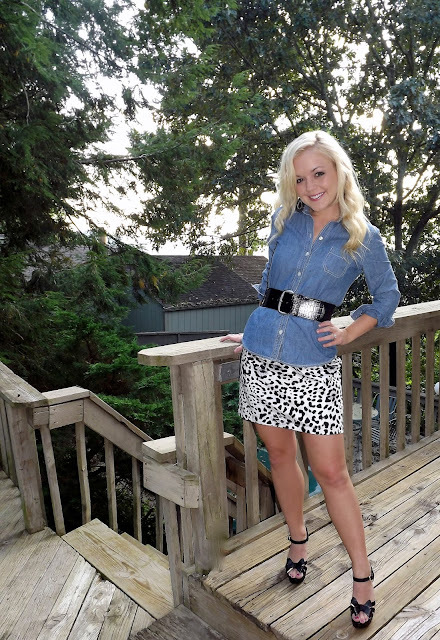 Love how you paired such a casual chambray with a bold skirt. Those glasses look great on you too!! So cute! I am defiantly going to have to steal this outfit idea for sure!